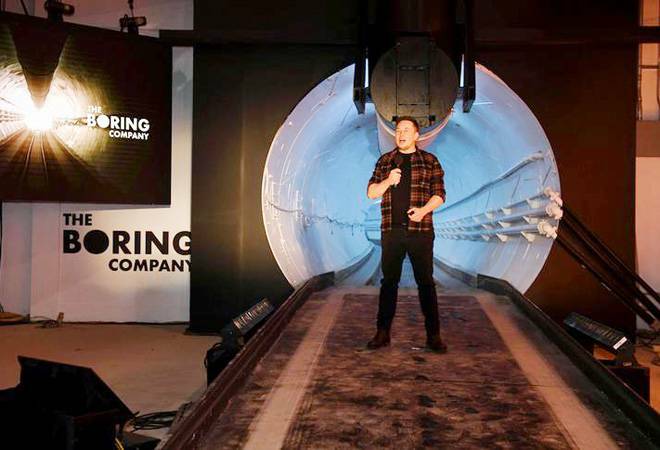 The Boring Company, Elon Musk's underground transit venture, has unveiled its first tunnel, two years after the billionaire entrepreneur complained about Los Angeles traffic and vowed to "just start digging" as a remedy. The tunnel, an initial proof-of-concept, has been excavated along a path that runs not through Los Angeles but beneath the tiny adjacent municipality of Hawthorne, where Musk's Boring Company and his SpaceX rocket firm are both headquartered. In a tweet earlier this month, Musk said the big reveal would include "autonomous transport cars & ground to tunnel elevator cars." Boring's website describes a system of passenger- and automobile-carrying "skates" that can zip through the tunnels by way of electric power once they are lowered underground from street level. Musk, best known as head of the Tesla Inc electric car manufacturer and energy company, launched his foray into public transit after complaining in December 2016 that L.A.'s traffic was "driving me nuts," promising then to "build a boring machine and just start digging." Musk also created a stir by promising free trips through the tunnel once it opened - "like a weird little Disney ride in L.A." - to get public feedback before proceeding with a larger system. "There will be no cars or people in the research tunnel," according to the minutes of a special Hawthorne City Council meeting in August 2017 to review an easement for the project. On its website, the Boring company said that "due to unbelievably high demand, tours through the Hawthorne test tunnel are by invitation only." But Musk's company announced it was moving ahead with a proposed tunnel across town to connect Dodger Stadium, home of the city's Major League Baseball team, to the existing subway line. In June, Boring was selected by the city of Chicago to build a 17-mile underground transit system linking that city's downtown to O'Hare International Airport. The company also has proposed an East Coast Loop that would run from Washington, D.C., out to the Maryland suburbs.